We have now been in Saigon for a week. So has it been everything we expected? It’s really big, really crowded, and very noisy. I haven’t been this overwhelmed by a city since I first visited Bangkok in 2012. I am not quite sure how to describe it. You are never walking alone on a street. There are always people around you and the sound of traffic. So far, I have seen no beggars (unlike Thailand) even though we are staying in a very touristy area of District 1, only two blocks from the backpacker area. In the backpacker area and around the Ben Thanh Market, you will encounter a steady stream of people trying to sell you sunglasses, bracelets, or some other junk. Some of them can be very aggressive and don’t give up until you have said no a dozen times and walked far away. Outside of these two areas, you are left alone. I am going to get run over trying to cross the street. Crossing the street in Saigon terrifies me. You have to walk straight into traffic at a steady pace so that the motorcycle riders see you and can go around you. There is a sort of rhythm to it. It is not usually possible with a toddler in a pushchair. I only take Little Nomad out in his sling now, which is a little inconvenient if I want to take him out during his nap time. Vietnamese people really love children, especially blonde toddlers. The attention that Little Nomad gets can be overwhelming. People smile at him and want to take his photo. Some ladies take it too far by patting his cheek while he is napping which always wakes him up. Another lady followed us down the street and kept leaning in to pinch his cheek. Shopkeepers give him age inappropriate candy like lollipops that I have to take away because I worry about him choking. He got attention in Thailand and Cambodia as well but nothing on this level. Sorry but it is true. I know many people who sing its praises but I am just not a fan. An iced coffee in Vietnam is gone in four sips for me. I miss iced coffee the way it is done in Thailand. As a small consolation, many cafes give out free iced green tea, so that helps pace out those four precious coffee sips. I have died and gone to food heaven. I love Vietnamese food but there is usually a very limited range of it served in Vietnamese restaurants in Europe. For example, Prague has a large Vietnamese population and many restaurants but you will see far more pork and beef based dishes and not that much seafood. Part of that is from the fact that the Czech Republic is landlocked and part of it is that restaurants tend to cater to Czech tastes. Since I don’t eat pork or beef, I am usually limited to tofu or prawn based dishes. Saigon, on the other hand, is pescatarian heaven. And don’t even get me started on the delights of banh mi sandwiches. I have an egg banh mi every morning for breakfast and stop at the banh mi ca moi (sardine sandwich) stand every chance I get. 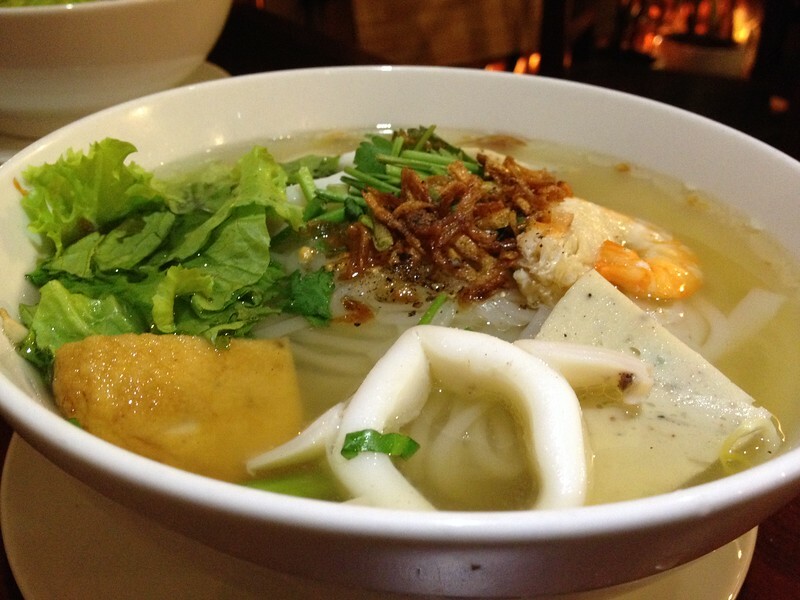 Seafood noodle soup at Sadec Quan. I will never be able to speak this language. I still can’t even hear the separation between words when people are speaking. It all runs together for me. However, the Vietnamese language has the great advantage of using the Latin script (with some additional accent marks). This means that I am already memorizing lots of Vietnamese words and starting to read simple signs, something that I can’t do in Thailand or Cambodia. That is the big question that I don’t have an answer to yet. We got a three month visa just in case we wanted to say for a couple of months. I am having trouble finding a cafe where I am comfortable working. I think we will need to find a coworking space if we want to stay. But for the moment, I am happy just exploring.